Branson's uniqueness is highlighted by the ability to be in the middle of town and still see lots of natural beauty. 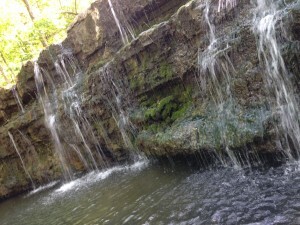 The city's Waterfall Trail is a great example of how nature is around every corner! The 2/3 mile trail (each way) is easily accessible from a trailhead and parking area near the intersection of Shepherd of the Hills Expressway and Roark Valley Road. The trail is well-marked and begins near the main entrance to Westgate Resorts, and there are two parking spots down the hill from the trailhead. If those are taken, you can parallel park in that area. Be friendly and wave to the Westgate guard-shack when you start your hike. 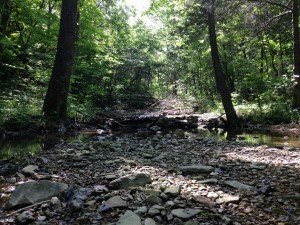 The trail follows the creek-bed of a tributary of Roark Creek. It's a fairly level hike, but the creek swells after a rain, so be prepared for a muddy (or wet) hike at certain times of the year. The trail crosses the creek several times, and some parts of the trail puddle, so it's a good idea to wear shoes that can handle at least 1 inch of water or mud. Along the way, you'll see several small waterfalls and some small bluffs. At the end of your hike you'll find the reason for this trail's name: a several-foot-high waterfall. It's beautiful from several angles, and you can continue on the trail to the top of the falls and even continue hiking upstream. Or you can sit on a rock nearby and have a picnic lunch. Don't miss out on other outdoor fun in Branson!